What if you got out of the office and went to the front lines. Got in the truck. Put on the coffee. Picked up the garbage. What would you learn about your company and yourself? 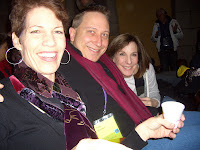 And…Trish, Todd and I soaked up Sundance with a gaggle of pals. Independent movies are best when perspective rattling. We saw The Mormom Proposition, The Freebie…and Dry Land in one mega day. One more thing…in an attempt to underwhelm you to greatness we created the Step by Step program.